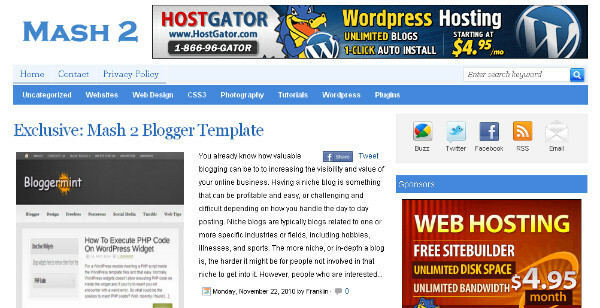 Best Blogger Templates Style - Mash 2 is a two column Magazine Blogger template with a right sidebar.The color scheme is bright and mainly white.This template is designed to look and feel the same as the template used by the popular tech blog Mashable.You can download The Mash 2 Blogger Template for Free from BestBloggerTemplates.Net. Going to try this one out on my free samples blog. Thanks! Thank you very much for sharing... you can check out your pimped themes. i actaully used them in my blog!